As mentioned in the previous article, any Reader dataset – in any format – can be used as the source for the outgoing schema. The key thing to remember is that the dynamic writer needs to be able to find that schema definition, by name, for this workflow to work. So what happens when you are using a brand new name to write out your data? In this situation, you need to use a special parameter inside the writer's feature type called 'Schema Definition Name'. This parameter informs the writer of the correct name to use when searching the source for a matching schema. Your Schema Source or Destination is a database and the Feature Type names contain the Table Qualifier (e.g. <prefix>.<table_name>). This is a common challenge with dynamic workspaces. In the following example, a project has been setup in order to provide updated city schema in the form of a database. This database has been predefined but contains generic feature type names. In order to create a dynamic workflow and write out the data with the schema from this database, the database must be added to the workspace as a workspace resource. We will then change the output dataset names to include the city as a prefix (i.e Vancouver_BusStops). Open FME to a new workspace and from the Readers menu select "Add Reader". From the Writers menu select "Add Writer". 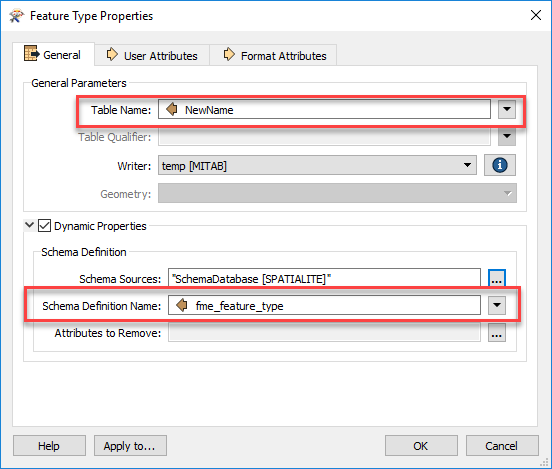 Make sure the workspace contains the correct mappings to match the new attribute schema contained by the database. In this example, the AttributeManager transformer is used to provide this. Use the table below to create your attribute map. Connect the AttributeManager to the StringCocatenator, and then connect the AttributeManager Output port to the Dynamic Writer. Run and then check the output datasets have the correct schema. At this stage, any future updates can be added to this workflow without changing the existing workspace layout. 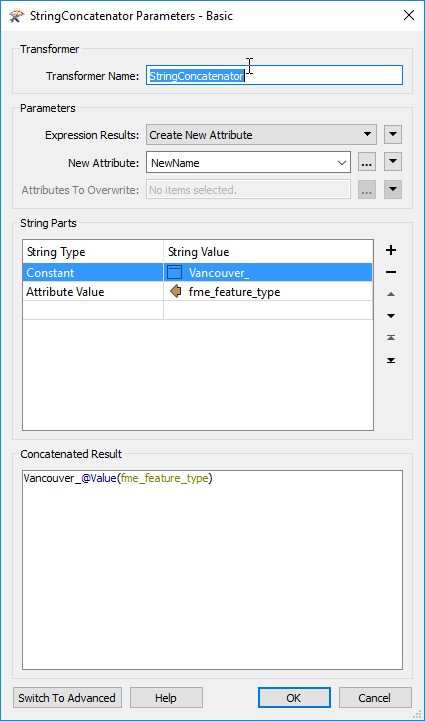 As well, changes can be made to the database schema outside of the FME environment and the workspace can handle the new schema automatically. Note: In the above example, if the database schema did change, a user would need to correct the AttributeManager transformer to provide the correct attribute mapping. however, using a SchemaMapper transformer in this scenario would provide an external method to handle any mapping issues, making workspace changes unnecessary. For complex workflows, this is a perfect way to alleviate maintenance issues in the future. This is discussed further in Advanced Technique - Using the SchemaMapper.